Golden Destiny Hotel is located in the serene Ajao Estate Area of Lagos. It offers comfortable lodging in well-designed rooms. Wi-fi and modern amenities are available to ensure guests have a memorable stay. It is situated at 6, Awoniyi Elemo Street, Ajao Estate, Lagos, which is about 15 minutes’ drive to the Murtala Muhammed Airport, Lagos. Golden Destiny Hotel is an ideal stopover for business travellers and a perfect lodging for international and leisure travellers in need of world class basic amenities. Rooms are categorised as Standard, Executive, Superior Executive, Deluxe, Mini Royal and Royal. 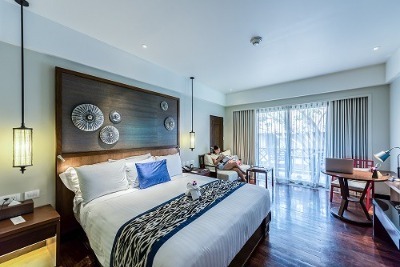 All rooms are made comfortable with features such as air conditioners, Intercom systems, LCD TV sets, tea facilities, mini fridge, work desk, wardrobe, sofa and comfortable beds. Bathrooms are standard with electric water heaters and bathtubs. The restaurant is furnished with 4-seater tables and offers both local and continental meal options while the bar/lounge is suitable for relaxation over choice drinks. The hotel also has a gym facility as well as an event hall. Wifi access is available throughout the premises. Guests are welcome to request for additional services such as laundry/dry cleaning, room service and ironing. Security is guaranteed with police patrol, security guards and CCTV cameras. Q: Does Golden Destiny Hotel have a swimming pool? Q: Does Golden Destiny Hotel offer free parking? A: Yes, on-site parking is at no extra costs. Q: Does Golden Destiny Hotel offer free internet access? A: Yes, free Wi-fi access is available. Q: Does the hotel offer complimentary breakfast? A: Yes, an on-site restaurant is available. Golden Destiny Hotel Limited is a budget hotel in Ajao Estate, Lagos. The hotel is a nice place to be and indeed, it was a nice time I had there. The environment was clean, serene and cool. The staff were nice and friendly. The facilities available were working well. The room was well cleaned. The bed was comfortable to sleep in. The sheets were cleaned and the house keepers came regularly to clean the bathroom. My stay at the nice,the hotel was nice and calm, I love the location and serenity of the environment., it was absolutely conducive. Their room service was prompt and efficient and all facilities were modern and new. Water and power supply was available throughout my stay and their food was delicious and affordable. The hotel is a good place to be, I am highly impressed with their services and would love to stay again. The hotel is quite up to the standard and beautiful. I really enjoyed every minute I spent at the hotel, it was easy to locate and very clean. The environment was serene, calm, refreshing and comfortable. Food was delicious and affordable, all the facilities were functioning effectively. My room was spacious and it had a functioning air conditioning unit, fridge and television. I also had a bathroom and toilet to my self and customer service was excellent too. I was so happy because the hotel maintained the standard I enjoyed during my honey moon in 2012 when I stayed there, I had a wonderful experience at hotel and will like to use the hotel again soon. I am Impressed! Standard hospitality service is strictly the watchword at this hotel. I was made very comfortable. Though I had to pay slightly higher than what I planned for, it was worth it. Power was uninterrupted. I hope to stay here again sometime. Have nice pictures of Golden Destiny Hotel Limited?